Being there for one’s pet can be difficult, because unfortunately many people receiving hospice care are also physically or financially unable to care for their pets. Simple tasks like feeding, walking, grooming, and trips to the veterinarian are difficult, if not impossible. Hospice SLO County’s Pet Peace of Mind program allows clients to complete their end-of-life journey with the comfort and companionship of their pet, without worrying about their pet's current or future needs. Many of these animals have never been in a kennel or without the constant love of a human companion. Pet Peace of Mind assures the continued support for the animal and a safe and loving foster home and permanent home for their beloved companion when they can no longer be with them. Hospice SLO County would like to share one heartfelt story about a PPOM client named Gracie. Gracie’s human mom was diagnosed with cancer and became too ill to take care of her. She requested a PPOM volunteer to assist with walking and other tasks. Eventually Gracie’s mom died from the disease. Gracie was placed in foster care and then adopted by a wonderful woman named “Jane”. Gracie was very happy with her new loving mom and home. After a couple years, her PPOM adoptive mom, “Jane” became too ill to take care of her and her family contacted Hospice SLO County to find a new home for Gracie. She was then placed in a loving foster home with other dogs and pets. Hospice SLO County staff worked diligently to find a forever home for Gracie. Ads were place all over social media. One call that came in regarding Gracie was one of great news. It was from a friend of “Jane’s”. “Jane” had recovered, but did not contact PPOM because she thought that Gracie had found a forever home and she did not want to disrupt her life again. So, it was with great pleasure that Gracie was reunited with her mom, “Jane”. They are now living a love-filled life together. If you love animals and want to help create a story like the one mentioned above, there are a variety of volunteer opportunities available. Please consider PPOM in-home client support, financial support or opening your home and providing foster care. There truly is something for everyone! 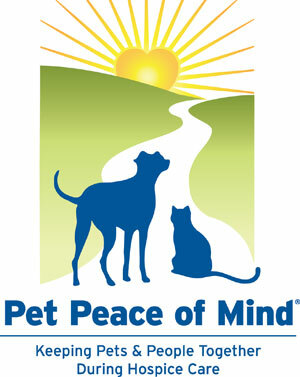 To learn more about the National Pet Peace of Mind Program please click here.